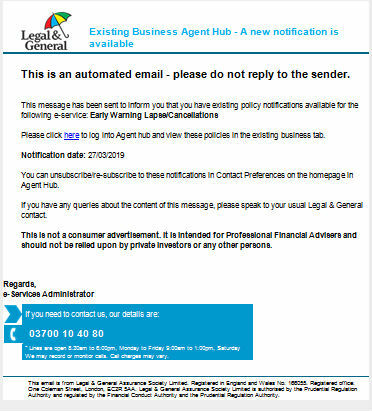 We’ve been listening to your feedback and are pleased to announce that we will be introducing a new feature in Existing Business Agent Hub from 29th March 2019. Our retention tool will now send you an email notification if a customers’ Direct debit fails or is cancelled – ensuring your customers are never left unprotected and you don’t risk a loss in commission. We’ve added more flexibility for you, as an Adviser, to include up to 3 email addresses to receive notifications and select whether you receive these or not. Visit your contact preferences in OLPC to manage these new options.